The other day I shared our recipe for Cream of Tomato Soup. This is the wonderful cheesy bread that I served with it. Anytime you need a great garlic bread, this one would be perfect. Try it with a different cheese if you prefer. I’ve found that even people who don’t care for Swiss cheese like this bread. In a bowl, combine the softened butter, garlic powder and shredded cheese. Mix well and spread on the cut sides of the french bread. Place on a baking sheet and bake for 15-20 minutes until lightly browned and cheese is melted. I’ve made a similar dish…our recipe has black olives. This is perfect…with or without tomato soup. =) MMMM good! I love all cheese, but swiss is my favorite. 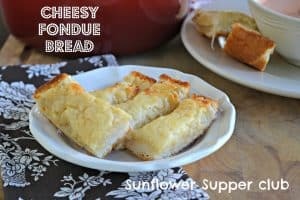 A recipe with bread, butter and cheese can never be bad. This bread looks so good! Thanks again for sharing on Foodie Friends Friday! Another great recipe, ladies! Thanks for sharing at Foodie Friends Friday!